Author(s): Angelo Verzoni. Published on May 1, 2018. America’s deadliest mass shooter came prepared. How NFPA 3000 encourages community involvement in the response to active shooter and hostile events. NFPA 3000 is only the second provisional standard released by NFPA in its 122-year history. Watch video of NFPA 3000 technical committee members discussing the importance of the new standard, explore the training NFPA has to offer on NFPA 3000, and more. Before Stephen Paddock killed 58 people and wounded more than 500 others at the Route 91 Harvest outdoor music festival on the Las Vegas Strip last fall, police and federal records show that the 64-year-old researched—and even visited—other locations and events as potential targets. He Googled SWAT team tactics, ballistics data, building heights, and terms such as “do police use explosives.” Paddock spent years legally accruing an arsenal of firearms that included more than a dozen semi-automatic AR-15 rifles, a type of firearm often used in mass shootings, and devices called bump stocks that allow those guns to fire like fully automatic rifles. On September 25 and 26, Paddock and unsuspecting hotel staff ferried over 20 duffel bags stuffed with weapons and ammunition up to a pair of rooms he had reserved on the 32nd floor of the Mandalay Bay Resort and Casino. On the night of October 1, Paddock unleashed a storm of bullets from the window of one of those rooms into the crowd of some 20,000 people below who were attending an outdoor country music festival. Concertgoers weren’t the only ones confused. When Craig Cooper, chief of special operations for Las Vegas Fire Rescue, arrived on scene, it had been determined that the bullets were coming from an aerial position, but responders weren’t sure how many shooters were involved. To make matters worse, the open-aired venue meant the scene kept spreading as the shooting continued. “Victims were either carried or moved themselves blocks away from where the event occurred,” Cooper told me in an interview in March. This resulted in inaccurate reports of other shootings in the area. “Our concept of what an event like that would look like was completely shaken up,” he said. Despite the bloodshed and graphic reportage, it didn’t take long for the country to collectively move on from Las Vegas and shift its mourning elsewhere. Just over a month after the Las Vegas shooting, a gunman killed 26 people at a church in Sutherland Springs, Texas. Three months after that, a gunman killed 17 people, mostly teenage students, at Marjory Stoneman Douglas High School in Parkland, Florida. Ten of the 15 deadliest mass shootings in modern United States history have occurred in the last 12 years, claiming the lives of over 250 people, according to multiple sources. The other five occurred over a 40-year span, from 1966 to 2006, claiming 85 lives. In a sea of divergent viewpoints over what constitutes a mass shooting and what trends are actually occurring, the definitive answer is that mass shootings are becoming more frequent, and they’re becoming deadlier. Against this backdrop, conversations began taking place among NFPA stakeholders on whether the organization had a role to play in addressing the problem, and what that guidance might look like. Both of those questions have been answered. In March, a committee of more than 40 public safety experts, with backgrounds ranging from law enforcement to medicine to government to the fire service, including Cooper, met at NFPA headquarters in Massachusetts to review public input and finalize the language for a groundbreaking new standard. 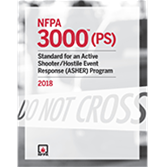 NFPA 3000™ (PS), Active Shooter/Hostile Event Response (ASHER) Program, provides a roadmap for first responders, medical professionals, community leaders, emergency management officials, facility managers, and the public as they prepare for, respond to, and recover from active shooter and other hostile events. (The PS stands for “provisional standard,” which means it was released faster than a regular NFPA standard.) And as we’ve learned from incidents like the Las Vegas shooting, when attackers are meticulously prepared to kill, communities nationwide must be equally well-prepared. The standard became available for purchase May 1. NFPA 3000 is based on four main principles: unified command, integrated response, planned recovery, and whole community. In interviews with NFPA Journal, NFPA 3000 technical committee members shared their personal experiences with active shooter and hostile events and often tied them back to these four principles to show both what went well in past events and what didn’t—lessons that were woven into the new standard. As the event unfolded, first responders converged outside the building. Although they had trained together for such incidents, command and communications at the scene broke down. It was like a game of telephone, Otto Drozd, chief of Orange County Fire Rescue in Florida, told me in an interview last year. Rather than a single unified command post, there was a police officer at the fire command post who communicated over the radio to a dispatcher who communicated to the police command post. “Even when we have fires or small-scale incidents, we have to work better with our law enforcement partners,” said Julie Downey, chief of Davie Fire Rescue in Florida, which responded to an airport shooting in Fort Lauderdale in January, 2017, and was on standby during the Parkland shooting. “As the scene gets larger—say we have a fight or a single person shot—we’re trying to get in and treat the person, but it’s also a crime scene, so we see a lot of issues when we’re not sharing information and we’re not respecting each other’s roles. A unified command has to happen, especially on larger-scale incidents.” Downey said she hopes the primary thing that comes out of the development of NFPA 3000 is fire and EMS working better with law enforcement, including sharing information. “It just has to happen,” she said. It wasn’t long ago that moving a rescue task force into a warm area, as Downey describes, would’ve been unheard of. (Hot, warm, and cold are used to describe the danger level in descending order in a given area during these events.) But today, an understanding exists that the quicker firefighters and paramedics can get to victims and the more police officers can be involved in administering medical care, the better chance victims have of surviving. This idea of an integrated response between police, fire, and EMS is featured heavily in the standard. It’s a shift that began to occur following the Virginia Tech shooting in 2007, during which a gunman killed 32 people on the Virginia Polytechnic Institute campus in Blacksburg, Virginia. “Rather than waiting outside, rather than waiting for patients to be brought to them, we’ve seen [fire and EMS] be more aggressive [in recent years],” said Richard Serino, chair of the NFPA 3000 technical committee. Serino spent over three decades working in Boston EMS before becoming deputy director of the Federal Emergency Management Agency within President Obama’s administration and now works at the Harvard School of Public Health. At the same time, Serino said, law enforcement has become more focused on administering medical care during active shooter and hostile events. “What we’re learning now is we cannot be siloed in our individual areas of concern,” said Dr. Ricky Kue, an EMS physician in the Boston area. “While law enforcement is worried about perimeter security, neutralizing the threat, and keeping any more deaths or injuries from happening, they’re also recognizing now that they have to be players in addressing bleeding and getting victims out to definitive care. … At the same time, EMS and fire personnel who have traditionally not worked in what we consider a law enforcement environment now recognize that we have to have some degree or ability to respond [in those areas] in these events.” Kue in part credits a well-executed unified command and integrated response with the fact that, in the Boston Marathon bombing in 2013, every injured person who was transported to a hospital survived. “It can happen anywhere,” John Montes, the NFPA staff liaison to NFPA 3000, said about active shooter and hostile events in April, during an NFPA 3000 presentation to NFPA staff members. He displayed a heat map of recent active shooter events in the United States that illustrated the point; while there were higher concentrations of incidents in a couple of larger metropolitan areas, essentially no corner of the country was left unscathed. Kamin said he hopes NFPA 3000 will provide communities everywhere with that awareness and a sense of the need to be prepared. For all communities, a critical part of preparation is conducting a risk assessment, as outlined in NFPA 3000, to identify the locations that are most at-risk for an active shooter or hostile event, and then making sure the people who are in charge of those locations, such as facility managers, are prepared. All this preparation, however, must occur with the knowledge that these events ultimately can’t be eradicated. Therefore, preparation must also account for the recovery process, which begins the moment an incident occurs. For many communities that have experienced an event like an active shooter, returning to a sense of normalcy can take years. On a more granular level, each individual touched by an active shooter or hostile event has their own road to recovery, separate from the community’s, and many of the NFPA 3000 technical committee members have waged these personal battles with recovery—and seemingly won. They drew on those experiences as they wrote the standard. Kamin, the doctor who responded to Sandy Hook, is a good example. As a first responder or doctor, exposure to death is often a part of the job. But as Kamin will tell you, nothing can prepare you for walking into a scene like the one he encountered at Sandy Hook. When he talked with me about that experience, Kamin paused frequently as he tried to come up with the right words to describe a situation that lends itself to speechlessness. “I walked out of that school and I was really afraid that I was broken, and that my ability to be a dad and a husband and a doctor and a friend had been completely turned upside down,” he eventually told me. “And I was very, very grateful and very happy when someone said, nope, you shouldn’t expect that as long as you … take care of yourself, get help when you need it, don’t do things that are destructive, and just let this process take shape.” The key words in that sentence are “as long as you,” and NFPA 3000 provides a framework for creating a list of things to be done to aid in recovery for both responders and the community as a whole. In October, 2016, when Drozd submitted the request for NFPA to develop a standard like NFPA 3000, he cited the need for such a document with statistics. “Between 2000 and 2013, over 160 active shooter events have occurred within the United States, killing 468 and injuring over 550,” he wrote on the new project initiation form. That was before Las Vegas, Sutherland Springs, Parkland, and others. The Las Vegas shooting alone injured nearly as many as had been hurt in the numbers cited by Drozd. The need for NFPA 3000 couldn’t be clearer. While committee members were at NFPA in March, news broke of an active shooter at a high school in Maryland. I watched as members scrubbed the news for updates on the incident via their cell phones. Not long after they left, another shooting occurred at YouTube’s headquarters in California. Ultimately, that need and a shared goal of saving lives are what powered committee members through a grueling four days of finalizing the new standard. Members frequently clashed over how specific the document should be and how it should be worded to address competencies for each group involved. Law enforcement, for example, doesn’t have the codes and standards the fire service has had for decades, and a lot of consideration was given to the apprehension law enforcement agencies might experience when faced with a document that outlines what they should do to prepare for responding to these incidents.